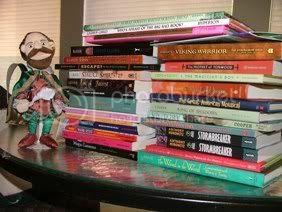 A partial stack of books and fun from TLA! New Edward Bloor! Autographed editions! William Shakespeare for the English teacher! Well, shoot -- until I saw that photo, I had been just fine with not going to TLA. Glad you had a good time and a great haul! I am fair seething with jealousy. What's the ratio of children to YA books in that stack? I wannem! So sorry I missed you. Would have been fun to put a face with a name!